I hope you're well & have eased gently in to the week! at the weekend! They sold out in a flash! No wonder, they are such great fun! They'll be available on the La Pashe website soonI'm sure. I used an 8"x 8" base for my card. 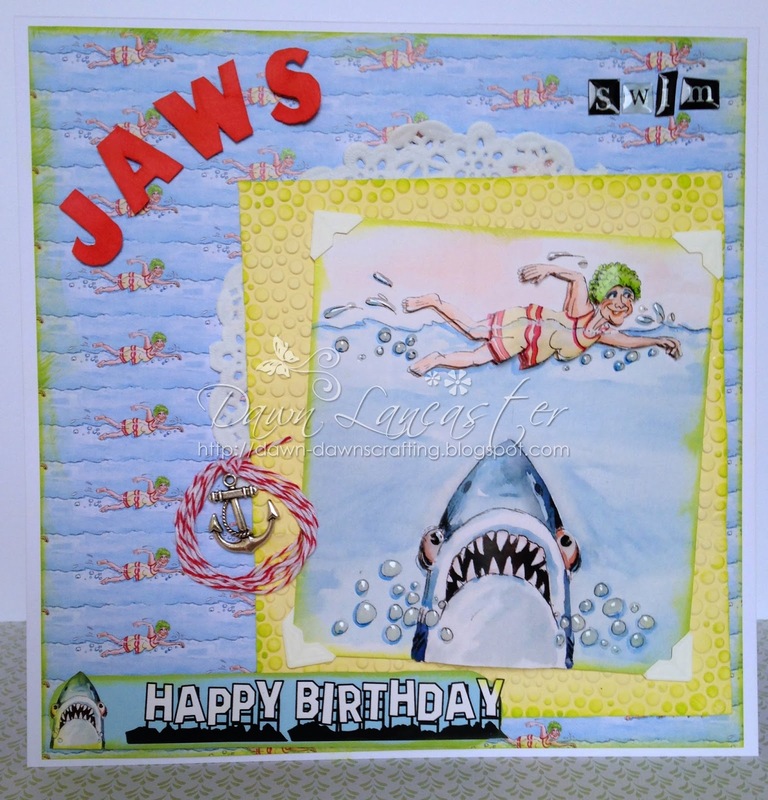 This design is an homage to the movie JAWS as you may have gathered! The design paper was made to go with the image. Although the decoupage isn't die cut, it's really easy to cut out. Anita's 3d Glaze to the bubbles & the sharks eyes. The edges were distressed using a pair of scissors & inked with a liquid chalk inkpad. The paper behind the image was embossed with a bubble folder. I found a font similar to the movie title image & fussy cut the letters. The glossy accent letters have been in my stash forever! Thanks for popping in to visit, it's always appreciated! A super fun card, which you always get from the Wrinklies. Great card Dawn. A fun image. OH goodness what a riot! Love your fun card and so appropriate since this year is the 40th anniversary of Jaws! Still don't want to get in the ocean! 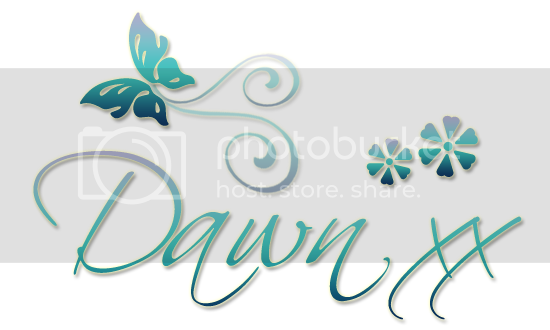 This is fabulous, Dawn! Such fun! 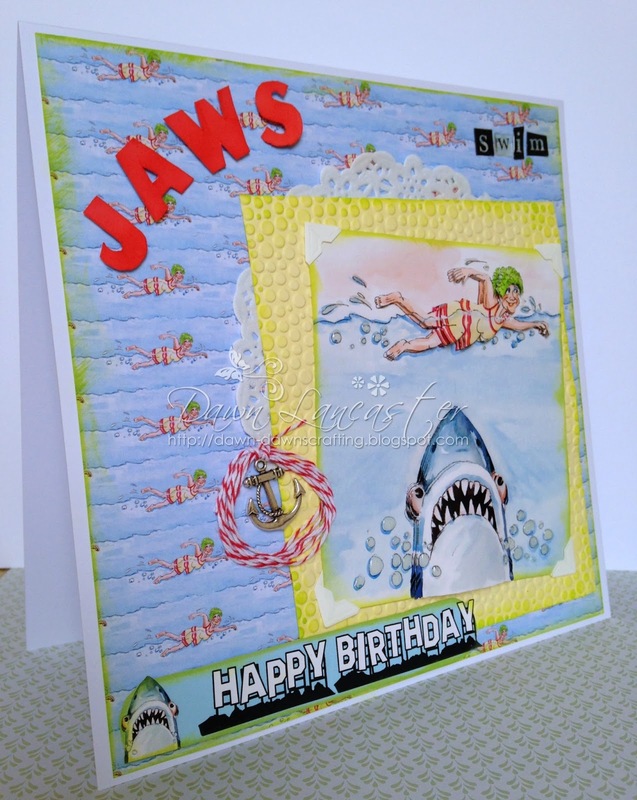 Loving the embossed yellow CS framing the image and the twine and anchor embellie. So very creative.